The slow-cooker is perfection to me. I remember when BL and I first started dating, he owned one cookbook- a 5 ingredient, healthy crock-pot book that he cooked out of constantly. I thought it was incredibly charming, this sweet Midwestern boy who knew his way around the kitchen. Of course, come to find out, he really only knew his way around the slow-cooker but by that point, it didn’t matter. I was head-over-heels smitten and I’m happy to pick-up the cooking responsibilities to this day, a decade-plus later. One of the first meals he made for me was a vegetable stew in the crock-pot. With only five ingredients, it got the job done for two grad-school students but a far cry from anything I’d request again. I’m pretty sure the base was a package of frozen vegetables and a can of cream-of-mushroom soup. Maybe a dried-herb or two for flavor. Well, we’ve come a long way from that dish. 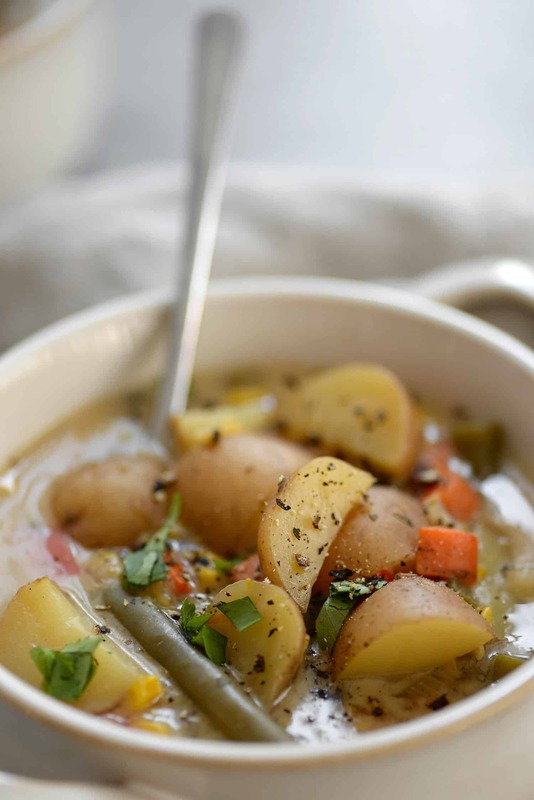 This slow-cooker chowder is thick, hearty, creamy and packed with vegetables. It’s the perfect meal when you’re craving vegetables and comfort. It might not be five ingredients, but it’s almost as effortless. The thing I dislike about most crock-pot meals is that you usually have to start them on the stove first. The slow-cooker is many things, but saute pan it’s not. Therefore, in order to have crispy, caramelized vegetables, you usually need to do some advance prep first. You can do that for this soup. Completely optional. And, if you are making this in your Instant Pot instead of a traditional slow-cooker, I might recommend it. Give the onions, celery and potatoes and little saute to soften before adding in the rest of the ingredients. Since the Instant Pot has a saute function, this shouldn’t add more time. But. But. You don’t have to. I’ve made this one now a few times and each time I become lazier and lazier. Dump in everything, cook on low until everything is nice and tender and you’ve got soup! To thicken without the use of additional butter and cream, stir in some soy milk and corn starch before serving. I’m calling for soy milk here as I think it gives more body than almond milk, but really, any plain-milk option should work. 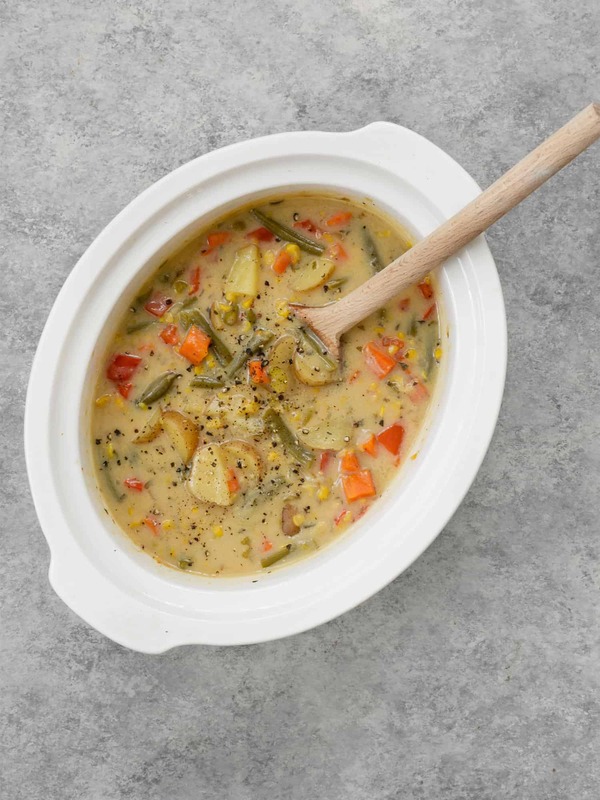 The corn-starch isn’t optional; it allows the entire soup to thicken to chowder status, which is what we want. If you want your soup even thicker, puree a little of the vegetables with broth in a blender and then add back to the soup. I do this trick sometimes when I want a really thick bowl of soup and it works wonders. 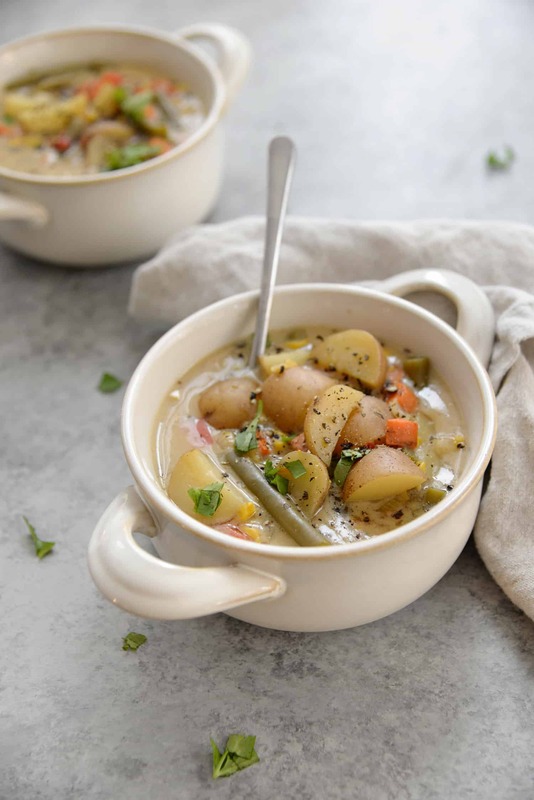 Place the onion, potatoes, carrots, pepper, green beans, celery, creamed corn, broth, parsley, basil, and oregano in the base of a crock-pot. Cook on low for 6-7 hours or on high for 3-4 hours until potatoes are tender and cooked through. Season to taste with salt and pepper; depending on the saltiness of your broth you may or may not need salt. I usually add 1/2 teaspoon and go from there. Whisk together the soy milk and corn starch until dissolved. Slowly add the soy milk mixture to the chowder and cook on high another 30 minutes until thickened. Serve! Any chance you have the instructions for the instapot? 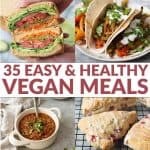 Hi Melissa- I haven’t tried this in the Instapot yet, but planning on doing so soon. My first guess would be, saute the onions and carrots using the saute function until soft, then add in the rest of the ingredients except for the soy milk and corn starch. Cook on manual high pressure for 10 minutes (then quick-release and see if if needs more time, the potatoes should be soft. I’d start with 10 minutes, but it might need longer like 15 minutes). Then, whisk together the corn starch and soy milk, add to the soup and let sit, covered, for 10 minutes to thicken. If you try this, let me know! 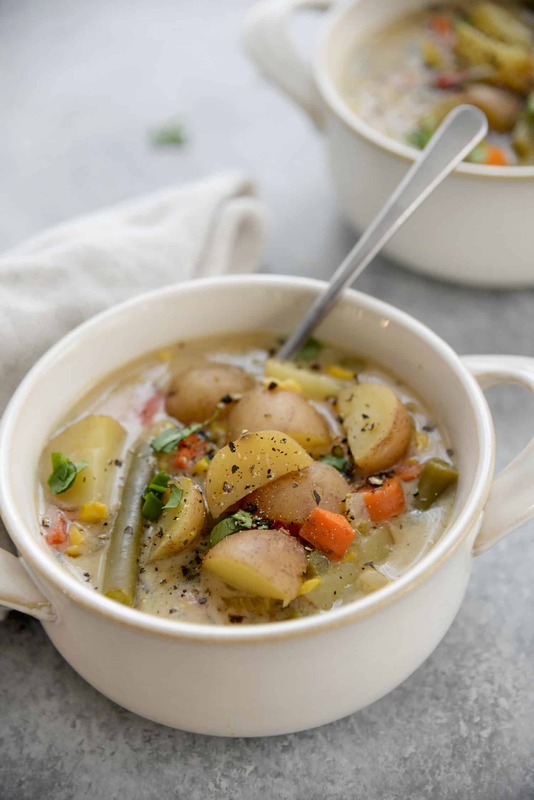 Again, I haven’t made this exact recipe in the Instant Pot but I’ve been doing plenty of vegetable soups like this and the times and methods seem to work out. Thanks! Hi, I found your inst so great. Congratulations for this space. I have questions abouth this. We need to cook 12 hours the soup over low heat? Hi Ana, you cook on low for 6-7 hours or on high for 3-4 hours until potatoes are tender and cooked through. Thanks! 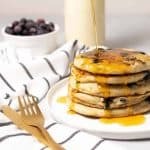 Hi Brenda- I used soy milk because I think it has more body than almond milk, but I don’t see why almond milk wouldn’t work as well! What kind of potatoes do you recommend? I used red potatoes. Thanks Megan! Thank you! Also I have been to two stores and can’t find cream of corn. My favorite but I do have cream of celery. What are your thoughts on that? Also, do you recommend any sub for corn starch? I have almond and coconut flour. Sorry! Just use regular corn, it might not be as thick, but it will work. The corn starch will help to thicken the soup without using additional cream or butter. I don’t think almond and coconut flour will work the same way. You can try it, but you might need to make a roux first- heat a little butter in a saucepan, add the flour (in a 1:1 ratio), then add in your milk and whisk until thickened. Then add into the soup! I made this recipe overnight in my crock pot and it turned out pretty well. It didn’t really thicken up during the half hour on high after I added the corn starch and soy milk, but if I wasn’t in a rush to pack it for lunch and get to work I would have just pureed some of the veggies and broth and added them back in, as you suggested. I also think next time I’d add some garlic, I didn’t realize the recipe didn’t have any until I tasted it. I tried making this on high over three hours but it didn’t really work out, so I lowered the temp and let it sit for a full six, but even after everything it didn’t really thicken up to what I’d call a chowder. The flavor was good, but it was just too watery still. I ended up making a roux to thicken it up on the stove, and added more salt and pepper and some paprika to serve because all the flour I used in the roux kind of dulled the flavors. BUT!! After adding salt, pepper, and paprika, it passes muster as a great chowder now. Not sure what I did wrong, if I’m just still not used to using the crock pot or what, but luckily soups are very forgiving. I love this recipe! Its a huge hit with one of my vegan friends…must have made it about 10 times for him!